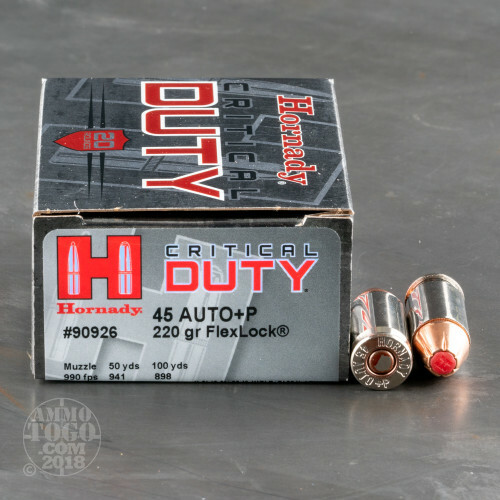 This 45 ACP +P cartridge by Hornady features the 220 grain FlexLock projectile. This bullet’s nose cavity is fitted with a columnar Flex Tip, which serves both to prevent it from getting clogged as well as to initiate expansion when impact drives it deep down into its core. The FlexLock’s high antimony lead core is exceedingly tough, and is also tightly connected to its jacket via an InterLock ring. 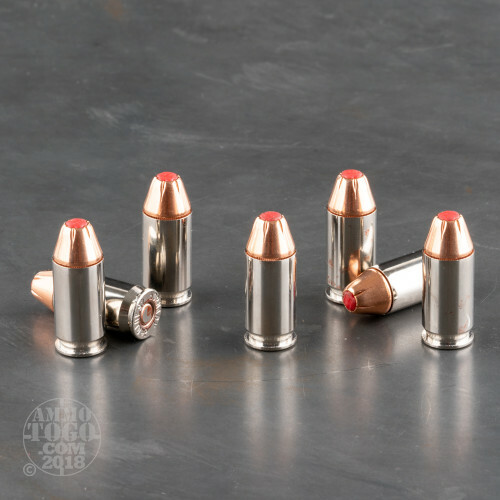 As the result it’s able to expand to far wider than its original diameter and retain the great majority of its weight while doing so, making this bullet the one to rely on when you absolutely must neutralize a threat quickly. 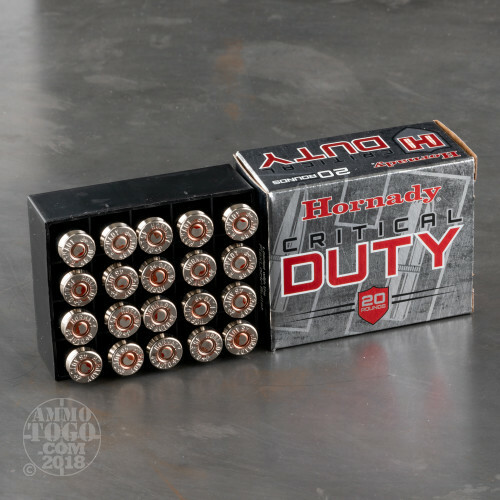 This Critical Duty cartridge also offers a nickel plated brass casing. Its reflective plating makes this round easier to spot during a hasty chamber check in dim lighting, and further promotes smooth cycling and grants superior resistance to corrosion. This round’s suitability for implementation in the dark is bolstered by its low flash propellant, which won’t blind you and rob you of your ability to fire fast follow-up shots or acquire a second target. Please never fire a +P round from a firearm that isn’t rated for it! 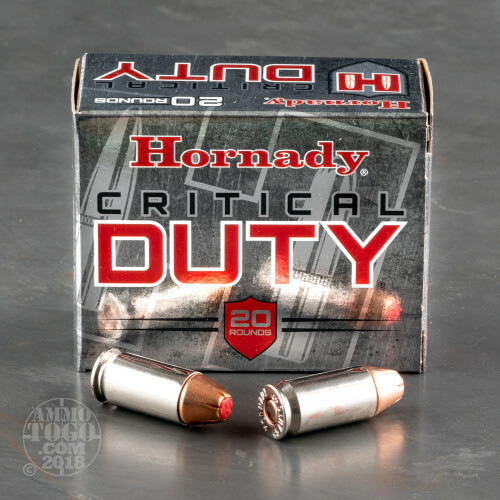 We fired five rounds of this Hornady Ammunition 45 ACP (Auto) ammo through a cloth barrier into Clear Ballistics calibrated synthetic gelatin and recorded the results. For these tests, we used a Ruger SR45 with a 4.5-inch barrel. In the photos, graphics and video on this page, you can see specifically how the Hornady Ammunition ammo performed and how it sticks up with the rest of the 45 ACP (Auto) ammo we have tested so far. Penetration Depth Compared to 45 ACP (Auto) Tested 0" 10" 20" 30" MIN 8.3" MEDIAN 16.7" THIS AMMO 19" MAX 32"